The NATO summit being held in Edinburgh has attracted a number of protests. The low turnout at some seems to be a direct result of the cloak and dagger tactics of the organisers. One friend reports an attempt to attend a demo on Friday, he was told to await a text, and also given a number where a message would be left giving details of the protest. He waited in a cafe, but half an hour before the advertised start time for the demo no text had arrived. He called the number, there was a message...informing him to wait for another message. Eventually he called home and got his partner to check the web where he finally found the details had been posted. Twenty protesters were at the rally point. The demo organised by the Stop the War coalition, the Scottish Afghan Society and Scottish CND was rather better trailed, and attended although mostly by East Coasters with Glaswegians concentrating on their successful opposition to the unpleasant 'SDL'. 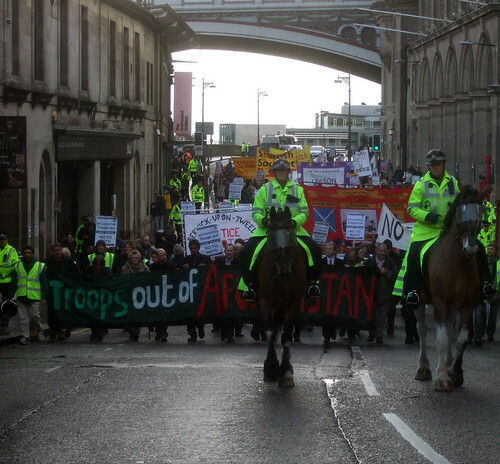 The demonstration marched through Edinburgh calling for the withdrawal of troops from Afghanistan. NATO Summit demo, Edinburgh 14.11.2009 from Alister Black on Vimeo.